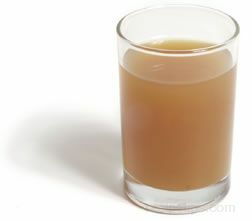 A beverage produced from pressing the pulp of apples to extract the liquid. Sweet cider is apple juice that has been pasteurized, but has no alcohol content. Hard cider is juice that has fermented, transforming the sugar content into alcohol. Hard cider usually has an alcohol content of no higher than 7 percent. Generally, apple cider and apple juice are very similar with only a few differences. Apple cider may be unfiltered and may be processed without preservatives, while apple juice is filtered and may have preservatives added. Apple cider may be unpasteurized if sold by small merchants such as vegetable stands, but will be pasteurized if sold in a food market. Apple juice and pasteurized apple cider are located on the shelf in food stores, while unpasteurized apple cider is kept refrigerated. For recipes from the United States, apple juice and apple cider may be used interchangeably in recipes without causing a noticeable difference in the end product. Since apple cider continues to mature as it sits in the refrigerator, it will begin to ferment, developing carbonation as it ages. If allowed to ferment for longer periods of time, it develops into hard cider, a product with a low level of alcohol content. The fermentation of the cider is not harmful for consumption and for some is preferred, depending on the taste and texture desire.